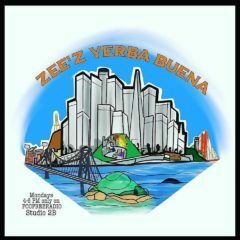 Zee’z Yerba Buena – Radio for the People, by the People. What makes San Francisco a great city? The weather? The food? The sites & sounds? What about our history? Not just history from text books, but the history of us, the people! As a native San Franciscan, San Francisco business owner, actor and comedian, I will take you on many adventures in San Francisco​ history! From my family’s and friends to people I’ve met working and living in the bay! Take a ride with me, and my many guests as we look at The City By The Bay on Zee’z Yerba Buena. Live from Studio 2B Mondays from 4-6pm. 4 Responses to "Zee’z Yerba Buena"
My brother. Always spreading love like grill cheese on toast amd what better with music. Keep up and stay up brother . Hey ammo,, I love it. Can’t wait until tomorrow’s show! Go Zee!